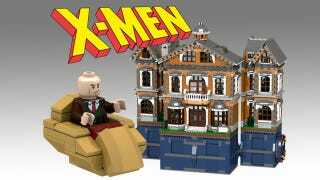 You may not be able to attend Xavier's School for Gifted School for Gifted Youngsters, but this proposed LEGO playset would let you act out your mutant school fantasies, from Storm's attic garden to Cerebro and the Danger Room. User DarthKy submitted this X-Mansion set to LEGO CUUSOO, where folks can submit and vote on their favorite LEGO ideas. The proposed set is massive, featuring several rooms from the mansion's interior as well as three staircases. Naturally, Charles Xavier, Beast, Kitty Pryde, and a number of other X-Men characters would show up in minifig form—although perhaps not nearly as many as DarthKy has included in the mockup. It would certainly be an expensive set if Marvel and LEGO decided to make it, but the result would be a pretty sweet stage for all your imagined X-Men adventures. You can see more mockup images on the campaign page, and if you dig the project, vote for it at LEGO CUUSOO.